Nowadays it is very popular to have social dancing as hobby; people go dancing to the themed parties, special events, and travel to the international dance congresses. So definitely the subject of social dance photography is getting more interest worldwide. Doesn’t matter what kind of dance you enjoy the most – the challenges of capturing a great dance moment are very similar. Have you ever seen dark, blurry photos, taken from a weird angle of yourself on the dance floor? I bet your answer is yes. Being a dancer myself I could relate to such matters too, which made me realize that it’s not an easy task to get great dance shots. So I started practicing. Gladly I had a lot of opportunities to do so due my active role in growing Zouk community in Abu Dhabi, capital of United Arab Emirates. Zouk is a Brazilian dance; very sensual and addictive. It is known as the dance of the 21st century, and is becoming viral all over the world. 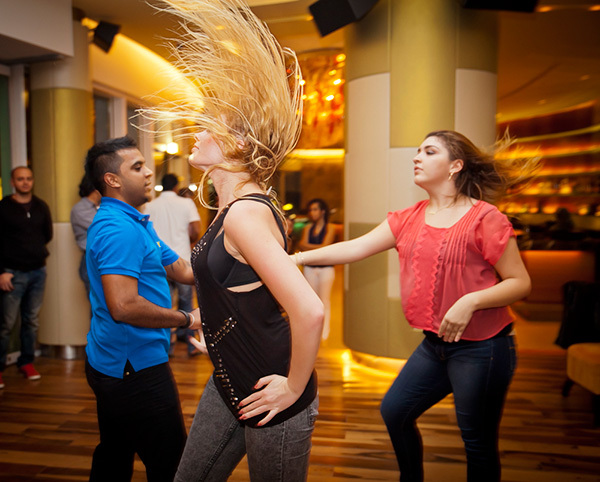 The rhythm of Zouk gives dancers a lot of flexibility and freedom to experiment and adapt their style to the music. It offers a lot of beautiful poses for photographer to capture (head flicks, body rolls, spins, twirls, dips and various hip movements). Social parties are usually happening in bars, restaurants, or ballrooms where the lights are dimmed. The trick is to expose for the ambient light (use a slower shutter speed, open your aperture as much as possible, increase ISO – up to 1600 worked fine with a Canon 5D Mark II), and use second curtain shutter sync for your flash. For Canon 5D Mark II users that option is located under External Speedlite control>Flash function settings>Shutter sync – check your camera’s manual if you have a different body. Not a problem if your shutter speed gets really low – you still will get last part of the frame frozen, thanks to those flash settings. You can get really creative if the ambient lights include lasers and rotating heads. By moving your camera sideways when the shutter is open you will get strikes and lines which will make your photos even more interesting. Sometimes it is hard to get focus right in a dark environment, so I usually have small pocket laser with me to light the dancers at the moment of focusing. Often with this option you get overexposed figures of dancers and a dark, underexposed background. If possible, scout the environment before the dance event. Search for white walls and ceiling, which can work as a large soft box to reflect light, and use bounce flash instead of direct flash. Another alternative is to use a portable speedlight softbox off-camera to diffuse, and soften strong light. Have you ever pressed the shutter release button and the slight delay gets you a photo of dancers with their backs to the camera, instead of what you imagined? Try to study movements (if you are not dancer yourself) to oversee what move comes next and press the shutter just before that so you catch the right moment. Each camera is slightly different, so test yours to understand. If your camera angle is too high the dancers’ heads will look bigger and their legs shorter – not always pretty to look at. I usually shoot at the chest level, or in some situations – waist level. Sometimes experimenting with getting really low works well too. Decide on the go what works for you – judge the available space between you and the dancers, and keep in mind how you’re using your flash (if you are bouncing it – you need some distance). My favorite social dance photography lens is 24-70mm f/2.8. It serves me well most of the time, though it depends on size of the party. If the crowd is big and you would like to show that, you might switch to a wide angle lens from time to time, for example, a 16-35mm f/2.8. This is up to you again, depending on dance aesthetics. One note: do not cut off hands or fingers and include a little space around the subject, so photo can breathe. Although this is very subjective, sometimes it can create a different mood when you fill the frame really tight. 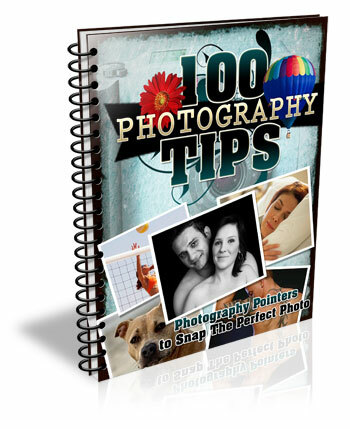 Apply the general rule of photographers; the more you practice – the better shots you get! I wish you happy social dance photography; hope you will make dancers look beautiful and graceful! Catch your moments! Please share your experiments in comments below and ask any questions there as well. The post Social Dance Photography Tips by Viktoryia Vinnikava appeared first on Digital Photography School.